By Meredith Clements. Article originally published by GoRiverwalk Magazine. At a recent City Commission budget hearing there was a lot of talk about water. Before the Cultural Division embarked on a project with the County’s Water and Wastewater Services, I was clueless as to where and why and how we receive the seamlessly flowing water from our faucets every day. My guess is that it’s not just me whose knowledge on the many facets and complicated infrastructure is – at best – limited. 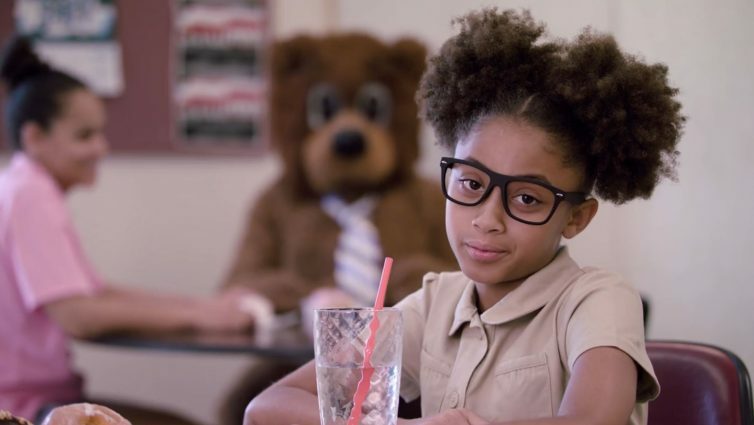 Enter: Lively and charming, ten-year-old actress “Chloe” and her teddy bear companion. An unlikely duo, these two take viewers on a whimsical adventure to explain the complex and important processes of wastewater treatment in Broward County and drinking water supply. Broward Cultural Division’s Public Art & Design program commissioned Damian Fitzsimmons of Brave Man Media to produce two short videos explaining the systems of Broward County’s Water and Wastewater Services (WWS). Fitzsimmons proposed the videos be fun, different and engaging – and that’s exactly what the viewers receive. The Journey addresses wastewater and Glass Half Full is about water services. The Journey was screened at the 4th Annual Filmed in Broward film festival earlier this summer and selected as an audience favorite to advance to the Fort Lauderdale International Film Festival (fliff.com), which takes place Nov. 2 – 18. Broward County is the 18th largest county in the nation. Its population continues to grow – the water supply does not. Residents of Broward County primarily depend on the Biscayne Aquifer for their drinking water supply. WWS Director, Alan Garcia, states that one of the major problems facing the water system is the ability to continue to meet regulatory changes which adds to the cost on the wastewater and water treatment side. However, the bigger issue, according to Garcia, is that utilities struggle with updating the system and making the necessary investment so they can replace aging infrastructure. WWS provides safe drinking water for 59,000 customers, regional wastewater services for over 600,000 residents, and stormwater and canal services that support aquifer recharge and flood management throughout Broward County. Residents in Broward are using less water per capita and seem to be conscious of the need to conserve water, especially for irrigation. “People realize they don’t need to turn sprinklers on every day,” says Garcia. He also adds that population growth is off set by the continued efforts for conservation and a pattern of customers using less water. Brave Man Media is a creative film production company. Sometimes they produce traditional pieces where the scripts are already executed. In some cases, such as with The Journey and Glass Half Full, the creatives delve into the client’s core concepts to expand the dialogue. “How do we tell the best story – to make it fun and make it memorable,” comments Fitzsimmons. “Our strength is narratives,” he adds. Brave Man worked with many County employees, some of whom appear in the videos. “We spent more time than usual on the projects because we recognize how important they are,” says Fitzsimmons. Join us at FLIFF this November to see these films on the big screen; visit @BrowardArts on YouTube or go to Broward.org/Arts.